Unions Lament Mich. “Right to Work” Law; What Impact Will It Have? After a bitter debate that shows no sign of stopping, yesterday Michigan Gov. Rick Snyder (R) signed two bills that made Michigan the 24th state to enact a “right to work” law. It is noteworthy that Michigan, long a strong bastion of organized labor, is the first so-called “blue” state to do so. “Right to work” allows workers to join unions without having to pay union dues as part of their terms of employment. 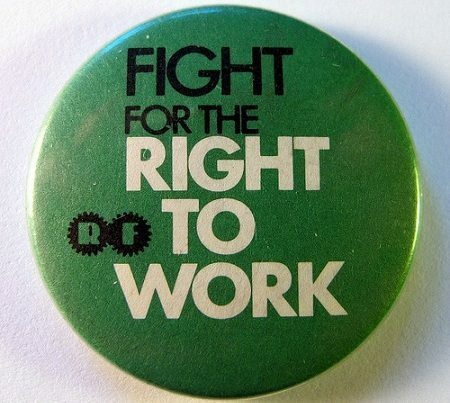 In a letter to the editor in the Muskegon Chronicle, Steve Keglovitz cut to the heart of union concerns, arguing that “right to work” should be called “right to work for less” because “that is exactly what happens in states that implement this language.” Research on the impacts of “right to work” laws has yielded results that both sides of the debate have used to support their arguments. For instance, a study from the Economic Policy Institute based on 2009 U.S. Census data found that workers in “right to work” states earn approximately $1,500 less per year than workers in states without such laws. But “right to work” supporters point to a study commissioned by the Indiana Chamber of Commerce that found that, from 1977 to 2008, employment grew 100 percent in “right to work” states as compared to 57 percent job growth in states without a “right to work” law.